Dangerous modern forgeries of this issue appearing first in 2015 are on the market. 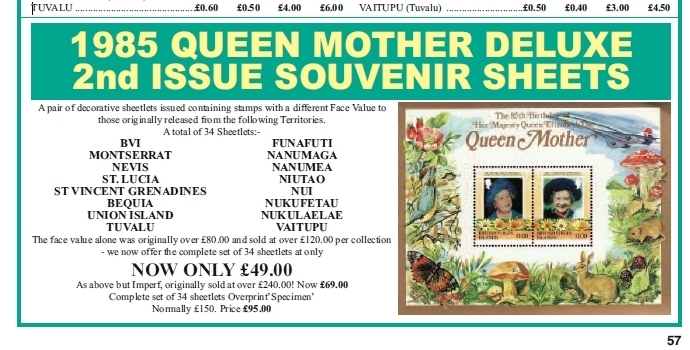 Fake perforated and imperforates and inverts are on the market! 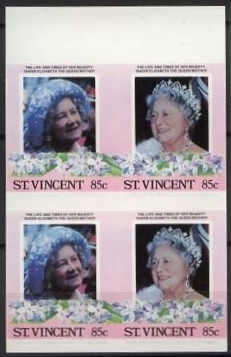 The Saint Vincent 1985 85th Birthday of Queen Elizabeth Stamp and souvenir Sheet Forgeries. 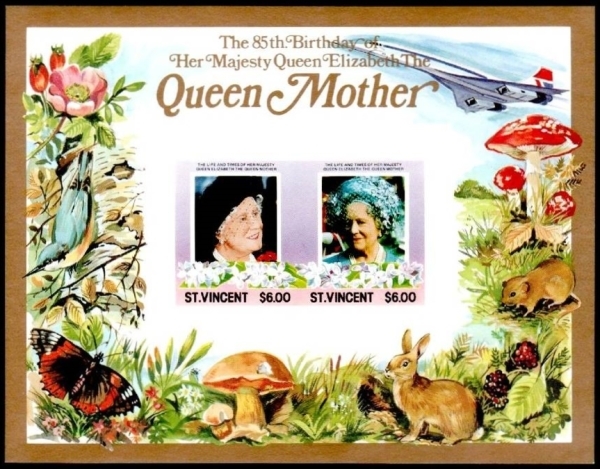 The 1985 85th Birthday of Queen Elizabeth the Queen Mother stamps issued for Saint Vincent are a beautiful set and very colorful. 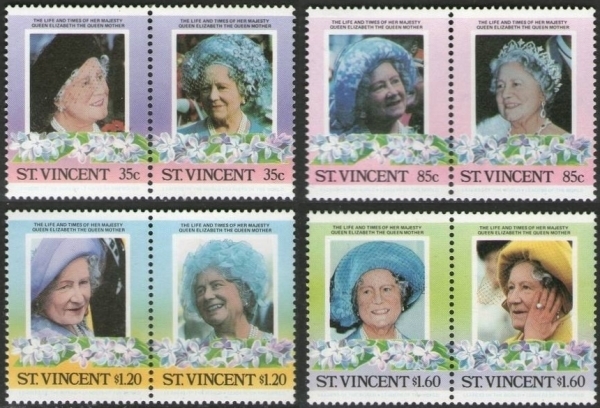 For Saint Vincent several "errors" were retained and evidence that there was a reprinting of at least the single issues! 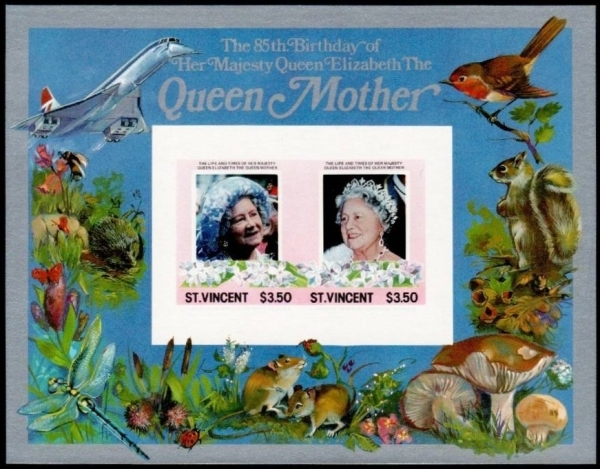 This is an image of the advertisement made in the Urch Harris Commonwealth Stamp Catalog made back in 1987-88 for the 1985 Saint Vincent 85th Birthday Stamps and Souvenir Sheets and varieties. I note no "errors" were listed at the time. I base this on quantities produced for LOW trains and cars for Tuvalu. 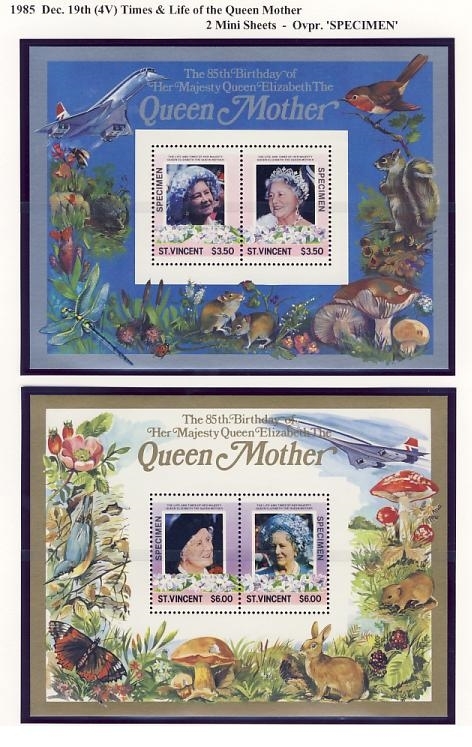 The original specimen overprinted sets were mainly confiscated and held in the police evidence stock until 2008. 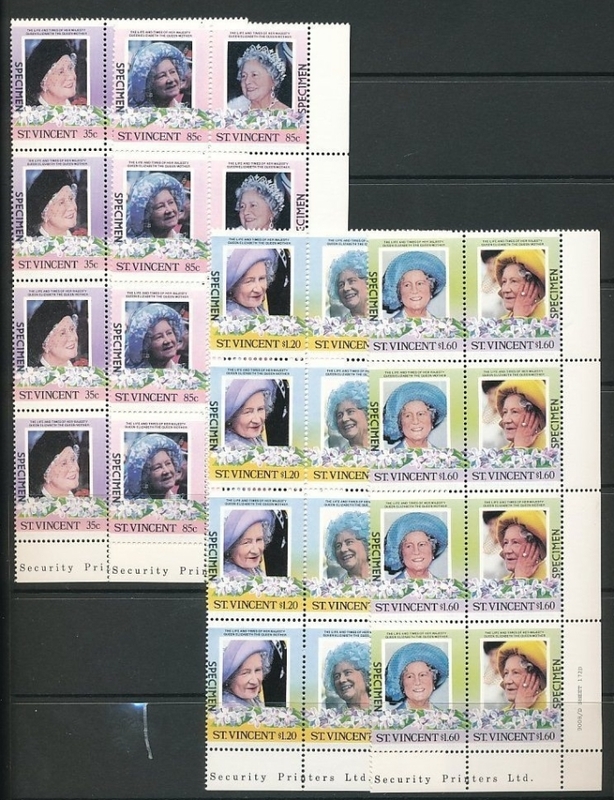 With the release and sale of the stock this set with specimen overprint has recently become available in quantity and is presently being sold in many lots on eBay of which the imaged set below is one of them. This shows most of the sets must have been retained. 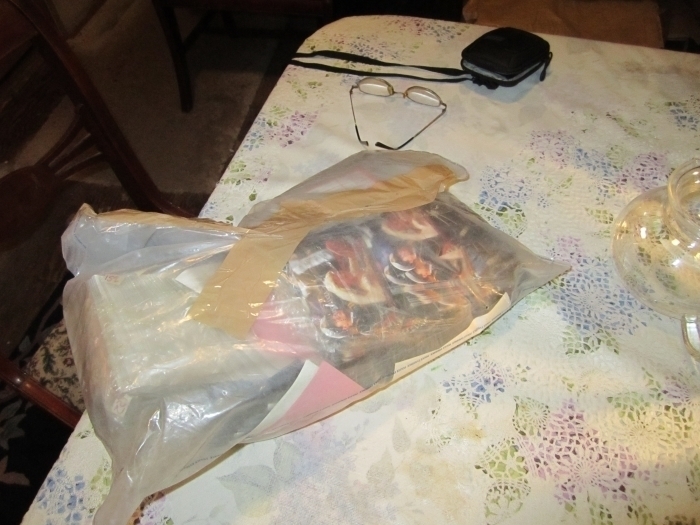 The quantity of the reprinted version that still exist is unknown. At present nothing is available on the market. It is possible they exist like gutter pairs from the Tuvalu set. It is unknown at present if any intact uncut press sheets still exist. These are definite made for collector errors. Simply made by skipping adding the yellow stage in the printing process. They are sold in various locations showing they were retained. 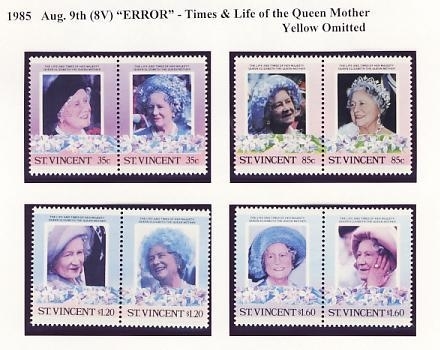 Standard practices of the printer were to produce 3,000 sets of these errors. They are an interesting novelty. Pricing should be no more than $7-10.00 for a set. 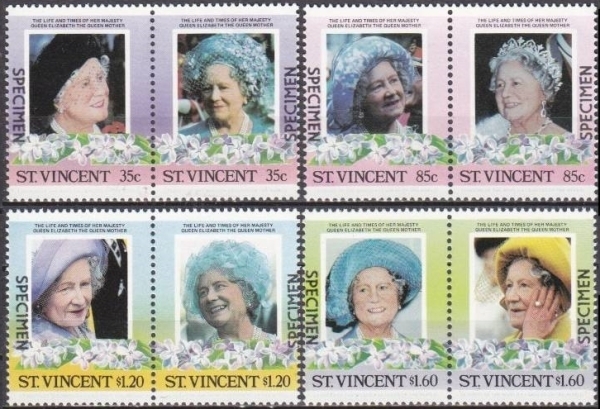 These are definite made for collector errors. Simply made by skipping adding the black stage in the printing process. They are sold in various locations showing they were retained. 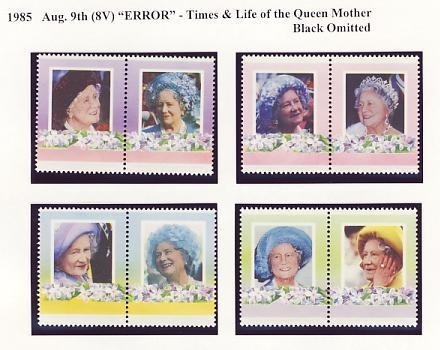 Standard practices of the printer were to produce 3,000 sets of these errors. They are an interesting novelty. According to the Urch Harris ad the 85c value is all that exist in regards to availability. This may hold true because at present I cannot find availability of any other values anywhere. Availability of even the 85c value listed is sparse. Pricing should run at $2-5.00 a pair. At this time I cannot find images of these. 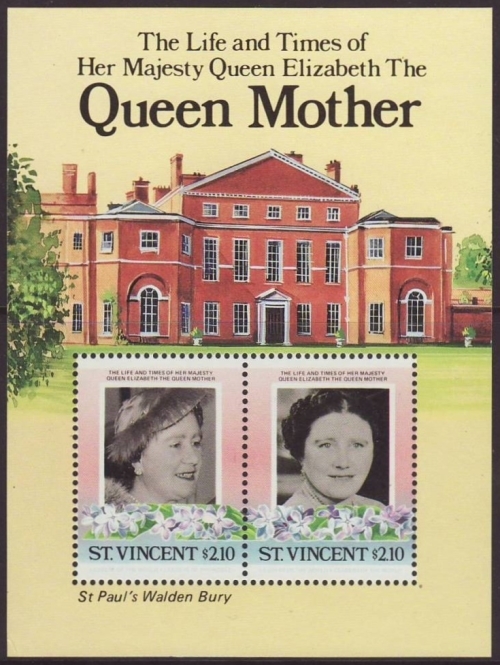 This "error" is found on both the values of the restricted printing souvenir sheets for Saint Vincent. Standard practices of the printer were to produce 3,000 sets of missing color errors. I believe this to also hold true for this type of error. It is sold through Rushstamps showing they have been retained. 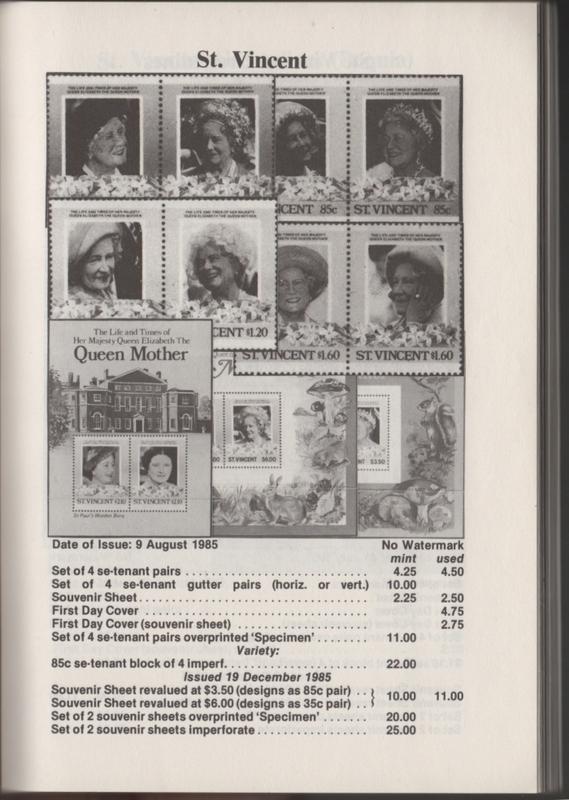 I have not seen any imperforate versions available. 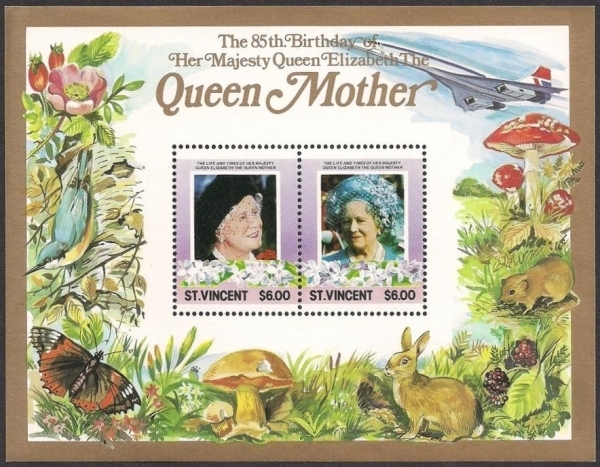 This basically sums up the stamp varieties for the Saint Vincent 1985 85th Birthday of Queen Elizabeth the Queen Mother Omnibus series. As new information and evidence is found it will be added to this page.